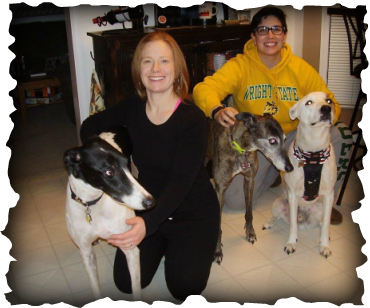 Katie and Jessie of Dayton lost one of their greyhounds to cancer last year and it was now time to add to the family. Alpha greyhound Princess needed another grey to share her home but mixed breed Jaxon could be pretty rambunctious. GLS Summersalt, now called River, is a mellow, affectionate, and occasionally timid boy who needs a quiet home with a family that knows greyhounds. Princess liked River immediately and Jaxon did a great job of keeping his enthusiasm in check. Katie and Jessie have a huge yard and River loves to run, so he and Princess took off racing their first time outside together. River will be a happy boy in his new home. We hope to see this family at lots of upcoming GAGC events.